After the event of this weekend, where normally we are only needing to remember our veterans but must now also remember those young men and women who died at the whim of a terrorist — of a misogynist extremist — I need to take a break from discussing fractured fandom and the sexist, and misogynist, tensions in geekdom to talk about something else. We could argue that professional wrestling does its part to reflect and affirm the sexism of the world. Many have written about this topic, from the way the female wrestlers are portrayed to the overtly dominating and violent masculinities that are presented as ideal, as role models for young boys to emulate. And while it is hard to see a lingerie match and not think about this problem, or to watch the painful submissions wrestlers force each other into and wonder if the fans believe such is the way of life — while those are the very reasons I avoided and even derided professional wrestling for most of my life — I am not here to discuss such matters. I am here because last year I saw the documentary For All Mankind: The Life and Career of Mick Foley and I decided I needed to get off my judgmental high horse and give this sports entertainment a chance. I decided to watch this documentary because I had seen Mick Foley on The Daily Show with John Stewart (such as here) and found him to be far more articulate and sensitive than I had considered possible of professional wrestlers, having grown up during the Hulk Hogan era. In the documentary, I was amazed to learn how much charity work Foley has done, and I further felt that he possessed the type of soul that I had not thought likely in those of his profession. Going further, learning about how he supports and advocates for women’s rights, gays’ rights, and a whole slew of causes important to me, just further endeared him to me. 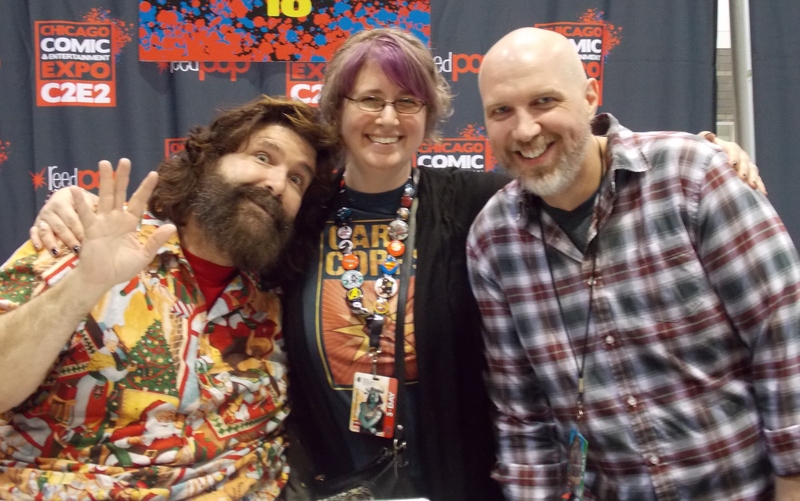 So much so that the highlight of my recent C2E2 convention was to have my picture taken with him. And it is not just Foley who displays these rather progressive stances — especially given the stereotyped nature of the sport and its fans over the years. Both former superstar (and I am talking mega superstar) Stone Cold Steve Austin and current contender (and soon-to-be Marvel star) Dave “The Animal” Bautista have come out recently in support of gay marriage. Learning these things, learning about the men behind the masks and the hyper-muscularity, helped me turn around my thoughts on professional wrestling, to be willing to give it a chance. And my partner has been helping me learn the lingo (heels, faces, over, etc) while we discuss the hyperreal and socially constructive nature of the entertainment. I have found it to be a fun learning experience, and I no longer hold the judgments I once did. All of that is to say that I come to this world relatively fresh, a wrestling newbie, with perhaps more of a scholarship angle than most wrestling viewers. 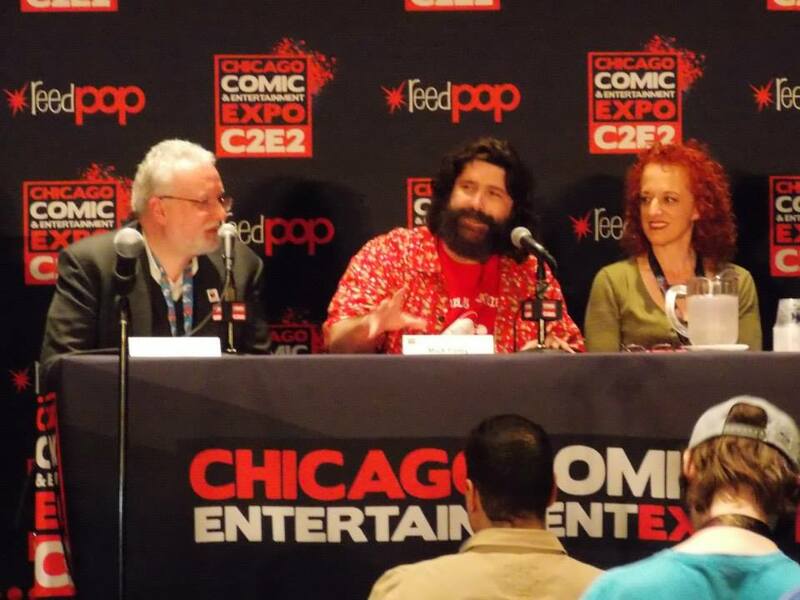 And it was with this scholarship angle that I attended a panel at C2E2 featuring my man Foley discussing the overlaps between comic books and professional wrestling. He was joined on the panel by illustrator Jill Thompson, who has worked with Foley on his children’s books, and publisher Jim Salicrup of Papercutz. One of the main overlaps the panel discussed was the focus on hyper-muscular characters in colorful costumes. This overlap was one my partner and I had repeatedly discussed (one the profession is quick to point out), and wrestlers have even utilized it in their performances, such as ECW’s Raven. There is the same focus in both media on very muscular — almost to the point of ludicrous – bodies that are covered, primarily, in skin-tight clothes emblazoned with colors and emblems that serve to identify the wrestlers to their fans in the same the way the superhero’s costume identifies the hero to its readers. Beyond these basic aesthetic similarities, there are also overlaps in the narratives — or, more to the point, in the way narratives are utilized in the serial storytelling of both media. In essence, Foley and the others remarked how the same storylines happen over and over — that if you wait long enough, the audience will have forgotten a storyline, and it can be recycled. But as they are recycling storylines, the wrestlers on the one hand and the comic book writers on the other need to find ways to make them seem new, fresh, and compelling. So stories of sudden betrayal can take on a different feel depending on who is betraying who or what cause — whether it is in the ring or in the panels. Another overlap includes the centrality of characters to the storytelling and entertainment. Fans fall in love with characters, have certain wrestlers or heroes that they look up to or despise, and then base much of their reaction to the stories on those characters, what happens to them, and how the characters handle themselves. Thus, for both wrestling and comics, the introduction or origin story for the characters are tremendously important to form those first impressions in the audience. And as the story progresses, having the right amount and kind of heat on the character, providing logical and emotional arcs of conflict and resolution, are necessary for sustaining audience interest. In both media, then, the storylines need to be good at character development. Foley grew up as a Hulk fan. He loved comics growing up and told us how he had a need to create heroes, which may be why he became a professional wrestler, although he did not realize the overlap until later. For Foley, until 1996, there was no scripting, no writers, that he had to listen to or rely upon to help him develop his characters and his wrestling style. There was just bookers, who helped him get from match to match. So he created and developed the characters, these heroes, on his own and always had to think for himself on the spot — and this need to be able to think quick and improvise continues to be a skill that the superstars have to rely upon. As he said on the panel, if a wrestler is not thinking for himself or herself, then that person will have less of a connection with the audience because he or she will not be good at sustaining characters and performances. Wrestlers who cannot improvise and perform lack the ability of negotiating and building authenticity with the audience — many of whom are very aware of the scripted aspects of the sport. Perhaps this ability to quickly think on his feet also explains why Foley currently tours the country with a stand-up comedy show. Another interesting overlap between professional wrestling and comic books are the times when they literally overlap — when comics are made about or feature wrestlers. 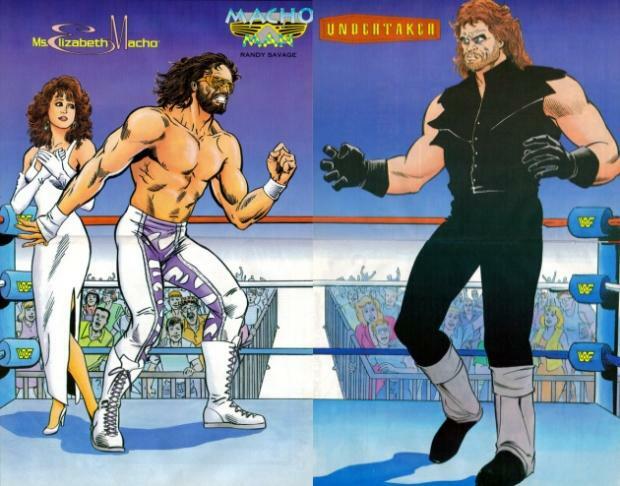 We can see this phenomenon going back to the early 1990s, when Valiant and Marvel comics had different deals with the then WWF (now WWE) to feature the WWF wrestlers in established or new series, with some being more successful than others. Currently, Super Genius, a subset of Papercutz, is releasing WWE Superstars, an alternate universe comic where the wrestlers are all versions of themselves, just not wrestlers (even though they know wrestling moves). The series is being written by Foley with his writing partner Shane Riches — hence the reason Foley was at C2E2. Another current title is independently produced Headlocked, which we also picked up at C2E2. Not focusing on any specific WWE superstar but on the art of professional wrestling, the comic does feature stories and art contributed from real wrestlers, such as Jerry “The King” Lawler — we totally got Lawler to autograph our copy. What’s interesting is how these overlaps between wrestling and comics show not just a blending or crossover of media, but also a mashing of different genres and generic sensibilities. For example, Foley’s comic utilizes genre conventions from film noir while still showcasing these larger than life characters that are central to professional wrestling. And, in a sense, this completely works and is completely understandable, because on the basic level, that is what professional wrestling is all about — mashing genres together. In the documentary released by the WWE for its 50th anniversary, some of the wrestlers and promoters interviewed discussed professional wrestling as combination of comedy, action, and suspense given how the characters and the storylines were constructed and presented — but we could also add superhero and melodrama to this mixture by commenting on the larger than life characters whose stories unfold in serialized, rather overly dramatic fashion in the course of days, months, and even years. In the special features for the film The Wrestler, there is a roundtable discussion interviewing former superstars like Rowdy Roddy Piper, Lex Luger, and Diamond Dallas Page. And while they promoted the film’s ability to show the reality through the construction, they likewise discussed the various genre elements that come into the production not just of a single bout but of an entire, years long feud. In other professional sports, the interaction between the fans and the athletes is there, but it is rarely seen and rarely important to the progression of the sporting matches except in key moments. 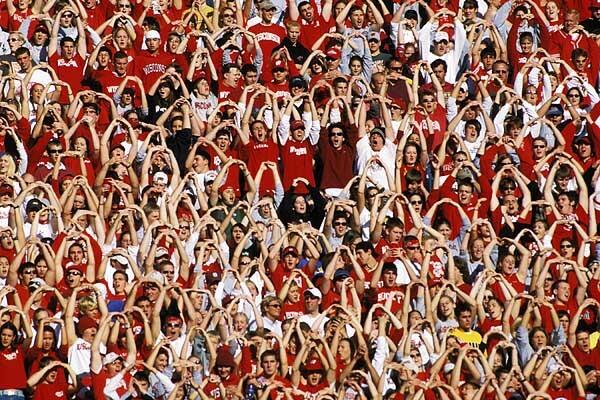 For example, in American football, a home team can have advantage for its defense through crowd noise. In baseball, the fans can aid their teams by psyching out the umpire and the batter, thereby potentially giving their team an advantage in hits. However, this is no where near the same amount or type of interaction between individual athletes and fans as seen in WWE, and professional wrestling at large. From my alma mater – Go Badgers! As mentioned, the wrestlers’ on the spot performance helps to determine whether or not they can connect with the fan and develop a successful character arc. If the fans are behind the wrestler — if the wrestler is over with them, in other words — then it can help to secure not only the storyline but the wrestler’s tenure within the industry. In the documentary on the history of the WWE, Chairman Vince McMahon basically said that they attend to the fans’ reactions to know what to do with a character and a storyline. In this way, the wrestling fan has input over the sporting and the entertainment aspects — if a wrestler is over with a crowd, then that wrestler may suddenly begin to win more matches, or to switch from heel to face. All of this is to say that professional wrestling mashes together genres, reaches out to its fans, because it has to. There is no need to negotiate authenticity and legitimacy in “real sports” given its non-predetermined nature. Except for the rare cases when a match has been rigged, there is no way to know with 100% certainty what the outcome will be — even a sure win could be suddenly undone by an unforeseen injury. Such sports do not need to have layers of genre conventions or outreach and empowerment of fans because the main entertainment comes in the not knowing, in the unscripted competition, in the realness. In such sports, the art of the game or the match is in the athleticism and competition of the players, not in the narrative and aesthetics of the characters. As mentioned at the C2E2 panel, there is an appreciation of both professional wrestling and comics as an art form in spite of their artifice. While we know someone writes and illustrates the battles of superheroes and supervillains, we do not base the comic book’s artistic value on its authenticity versus its artifice — there is no authenticity in superpowered beings battling for supremacy, no matter how realistically depicted (sorry, Christopher Nolan). We negotiate the meaning of such stories through what they do to us — how they make us think and feel — based on how we react to the narrative and aesthetics developed by the writers and the illustrators. In professional wrestling, we negotiate meaning, and thus authenticity and legitimacy, in the say way. Once you realize that a match is predetermined, then you need to see the art of the match in terms of its narrative, aesthetics, and athletics. We come to love certain wrestlers over others through their stories, through their appearance, through their interaction with us, both inside and outside of the ring (many of these superstars are adept at Twitter and Facebook). Moreso, since these bouts and stories can be comic books brought to life, we can also appreciate the sport as we do other sports, through the athleticism of the wrestlers, which is for the most part very real (except sometimes less so, John Cena). Once we learn and understand how the artifice produces professional wrestling, then we are left to negotiate what is authentic, legitimate, and meaningful about it by making these appraisals on the narrative, aesthetic, and athletic layers. How we determine what is the art of professional wrestling is a negotiation of the producer’s intention, what is in the text, and how the audience responds. And given the importance of those three layers, and the variety within each, there are many entry points and many points at which fans can defend professional wrestling as “yeah, it’s fake, but the story/appearance/ability of the wrestlers isn’t”. Once you have reached that point — once you have found the aspect of professional wrestling that aligns with your preferences for entertainment — then this genre mashing spectacle can be very compelling. Take it from a new convert, and perhaps a new addict as well. And Sid isn’t the only wrestler to portray that character, or to be inspired by him, such as the Road Warriors, who are probably the most prominent example of the Mad Max aesthetic in wrestling. So yeah, while I agree that wrestling is very polysemic, I think it’s also highly intertextual (which might explain the polysemous nature of wrestling in some ways). I would imagine there is also some cross-promotional aspects coming into play. Such as Hugh Jackman being a guest when he has movies coming out. Or the link between Marvel and WWE that we see being pushed. 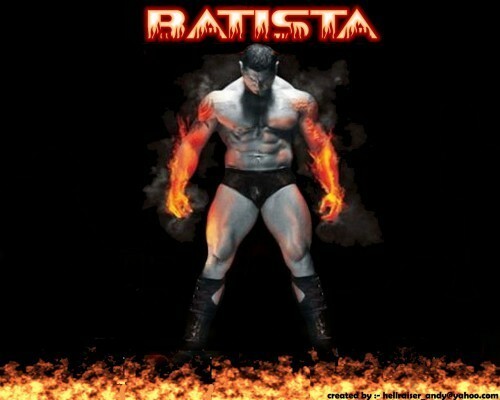 And perhaps Bautista’s current spotlight is due to the upcoming Guardians of the Galaxy. Because one aspect of intertextuality means being able to address fans who may not be as interested in the athletics but are interested in the narrative or the aesthetics, which, as you mention, may be drawing a lot from these other pop culture texts. So the more you can refer to them and have cross-promotions, then the more you can draw the fans of those pop culture texts into being fans of this one. There’s also potentially a fourth layer or aspect of professional wrestling that could draw a person in as they negotiate what is authentic or legitimate about the sports entertainment. Along with aesthetics, narrative, athletics, you could also have politics — people who are interested in the behind the scenes power plays and ego clashes, some of which are real, some of which are performance for the sake of the narrative. Thus this is another place where people may latch onto the text put out by especially the big league that is WWE — all of the Chairman power plays are sites of contestation and storytelling for fans to be engaged with. Also, this has been brought to my attention that apparently even furthers the connection between the wrestlers and the fans: http://www.chikarapro.com/ We are talking about a truly convergent pop cultural text and experience here.